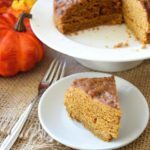 This clean eating Instant Pot Pumpkin Spice Cake is the perfect, small yield cake for the cooler months! If you’re as excited about Fall arriving as I am, then this is the cake for you. I’ve been dreaming of autumn since June when the weather starts to get unbearable in these parts. We had a triple digit June this year and I was not happy about it. Has real pumpkin in it. Not just the spice. I a bit on the dense side, which really works here. Is best eating soon after being made. Pairs well with either regular or coconut whipped cream. Would probably be amazing with a pumpkin spice latte. CLICK PLAY TO SEE HOW TO EASILY SLICE A CAKE WITH DENTAL FLOSS! 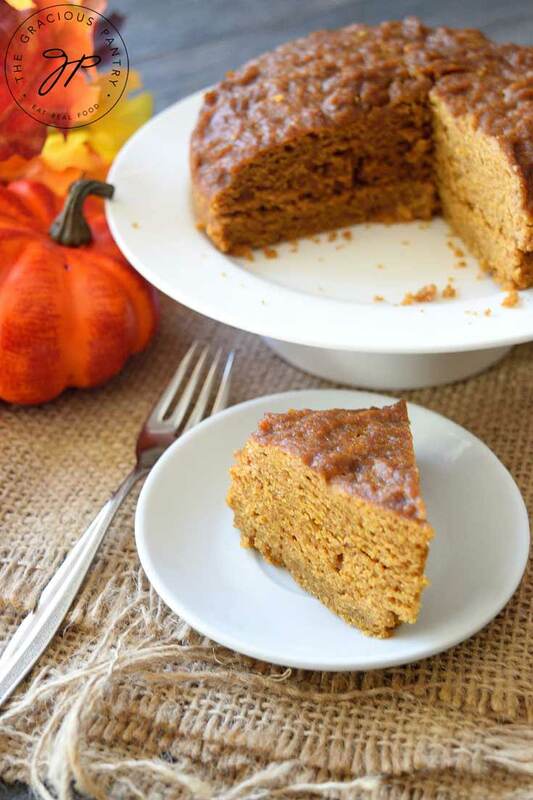 This delicious cake is perfect for celebrating the coming of fall without warming up the oven. Oil a 6 inch, round cake pan and set aside. Set a trivet inside the Instant Pot insert and pour in 2 cups of water. In a large mixing bowl, whisk together all the dry ingredients until well combined. Then, using a wooden spoon to stir, add all other ingredients and stir them together until well combined. Pour into the oiled cake pan. Set the cake pan on the trivet in your instant pot. Secure the lid on the IP and close the vent. Press the manual button and adjust time to 12 minutes. Allow for at least a 10 minute natural release before finishing with a quick release. Set the cake pan on a heat-safe surface and allow to cool enough to handle the pan with your hands. Run a spatula around the edge of the cake to separate the edges from the cake pan. Then turn over onto a cooling rack to finish cooling. Slice as desired and serve.